Samples, demos and giveaways! 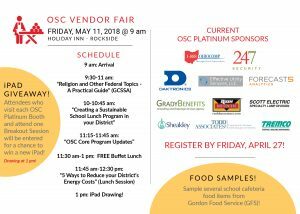 The OSC Vendor Fair is the perfect opportunity to test vendor products and samples. This year will feature lunch menu items from GFS. Please join us on May 11, 2018!